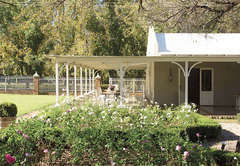 Pecan Manor is a Hartbeespoort Bed & Breakfast providing accommodation in 32 guest rooms for tourists visiting the Hartbeespoort Dam region. 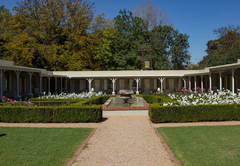 Nestled in the middle of a pecan nut forest in the Magaliesburg Mountains, Pecan Manor has a fascinating array of bird life as well as game such as Giraffe, Sable and Nyala. 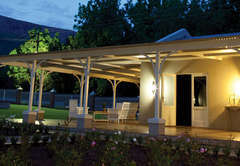 Pecan Manor offers a relaxing getaway and affordable accommodation in a French Provencal setting. 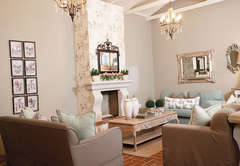 We have 32 Suites which can accommodate a total of 64 guests. 3 of the Suites are equipped with air-conditioning. Suites are furnished with King-size beds that can be converted to two single beds on request. One of the suites is an Executive Suite. Delicious meals are served in the dining room and there is a bar should you want a refreshment. 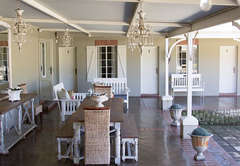 We have 32 suites which can accommodate a total of 64 guests. 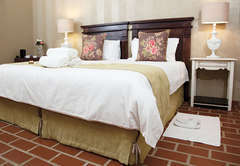 Suites are furnished with King-size beds that can be converted to two single beds on request.